Announcing a new way to enjoy Whitehead Light Station! Prices are per person and include course tuition, lodging, all meals (sample menu), and boat transportation to the Light Station from our mainland base. An additional 9% Maine state lodging tax will be charged on the meals and lodging portion of the fee. "Out on the islands that poke their rocky shores above the waters of Penobscot Bay, you can watch the time of the world go by, from minute to minute, hour to hour, from day to day, season to season." Whitehead Island is one of those Penobscot Bay islands, and the Whitehead Light Station gives one a wonderful view of many more: Two Bush, Metinic, Monhegan, Crow, Allen, Andrews, Hewett, and on very clear days, the Greens and Matinicus. We have offered many focused week-long courses at Whitehead Light Station, but we have heard from a number of participants that they would enjoy spending time at Whitehead without a specific focus. In response, we are happy to announce Stack of Books Week. 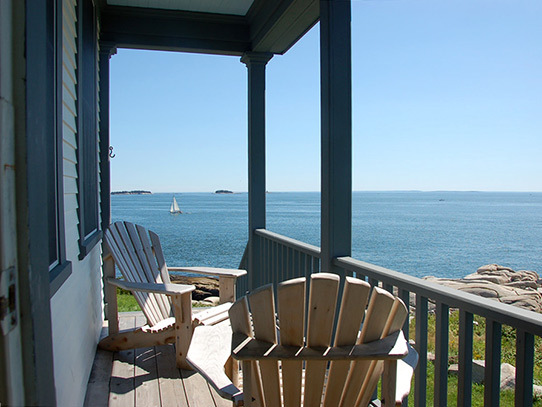 Sign on and join a few other lucky folks for five nights at Whitehead Light Station, one of the most restful and beautiful places on the entire Maine coast, to unplug, rest, eat well, read, and live by the sea. While you are in residence, there will be a number of opportunities to participate in different activities, all of which will be 100% optional. These may include learning to dig for clams, a boat trip to surrounding islands, some light work on the buildings and grounds, and afternoon or evening discussion groups led by experts in various fields. Why The Great Gatsby is: not about Gatsby, the Great American Novel, a poem. The more things change, the more they stay the same. Why there is so much that is familiar in today's version of American Populism. America & Money Madness ... what the 2008 financial crisis, "Hamilton," and the Salem witch trials have in common. So get that Stack of Books you have been meaning to read together and sign on today for the most restful and restorative week you've had in a long time!